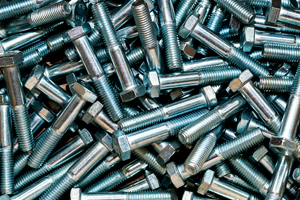 After the electroplating of metal fasteners, which are used extensively in the automotive or construction industry, it is essential that the metal product is taken through a thermal heat treatment process to prevent hydrogen embrittlement. Hydrogen embrittlement is the process in which hydrogen molecules in voids within the metal, create a pressure build-up, which can lead to internal cracks and failures in the field. If the metal has not started to crack, the condition can be reversed by baking out the entrapped hydrogen, as long as this is done within one hour after acid-treating the parts. The fasteners must be heated to a target metal temperature of 200°C (392°F) and held at that temperature for 4 hours within the product basket to remove (diffuse) the harmful hydrogen. To ensure that hydrogen embrittlement is not a risk to the future failure of fasteners while in use, it is necessary to monitor the baking/heat treatment process (post electroplating) to ensure that it heats the product sufficiently to diffuse any harmful hydrogen. The monitoring tool needs to provide evidence that products within the product basket at all levels achieve the critical bake conditions (Time @ Temperature). Such validation data is critical to allow supply to both automotive and construction industries, where regulatory requirements are strict.